The V&A Waterfront, also known as the Cape Town Waterfront, is home to a myriad of great attractions, restaurants, entertainment and shopping experiences. With its setting in Table Bay Harbour, framed by the skyline of Cape Town City and Table Mountain, it is no wonder that the Cape Town Waterfront has become one of South Africa’s most visited attractions. The development was started in 1988 around the historic harbour basins, named during the 18th century after Queen Victoria and husband Prince Albert of the old British Colony. Today, with extensive residential development and hotels, many call the Cape Town Waterfront home, while thousands visit the area on a daily basis to enjoy the many attractions and sights. The swing bridge periodically opens to allow larger vessels to enter the harbour basin. Two Oceans Aquarium – This is one of the top aquarium installations in the world with many great activities and exhibits to explore. The facility is especially child friendly with many hands-on activities, like the Penguin Experience and Touch Pool among the favourites. Feeding Times are also very popular, especially at the shark tanks.Visitors can further opt for a 90 minute catamaran boat ride around Table Bay to experience an eco-education cruise, whilst looking out for sunfish, whales, dolphins and seals. A brand new predator and shark exhibit will be opening soon and will feature a 10 meter long by 4 meter wide acrylic tunnel which promises stunning and intimate viewing of these fascinating sea creatures. Also check out the 2 Oceans Aquarium’s Facebook page for updates on events and the launch of the new predator exhibit. Watershed Crafts – A huge variety of arts and crafts await at the Watershed Craft Market. This recently upgraded facility offers design, art and craft lovers some of the top African, South African and a international creations. Health and wellness offerings, ranging from Shiatsu, Reiki, natural beauty and foot treatments. Market on the Warf – Just around the corner from the new Watershed Craft Market is the famous V&A Market on the Warf. The market features a collection of top purveyors of delectable gastronomic treats. Freshly roast coffee, chocolatier’s creations, craft beers, Champagne and oysters, Pizza, Fish & Chips and many more, share the culinary stage at this popular Waterfront food market. Have a look at the Market on the Warf website for more info. Cape Town Waterfront Restaurants – The V&A Waterfront has become one of South Africa’s most notable culinary centres with a selection of over 80 restaurants. The restaurants range from upmarket bistros, specialty eateries and cultural food experiences, to well known family restaurant chains. Waterfront Retail Shops – over 450 retail shops makes the V&A Waterfront one of the country’s most sought after shopping destinations. From top international brands to unique local offerings, there is literally something for every taste and need. Movie theatres and performing arts venues provide the latest in entertainment for a wide variety of tastes. Entertainment and things to do – The Cape Town Waterfront has become famous for regular events and free entertainment, with bands and other performers spicing up the atmosphere all around. 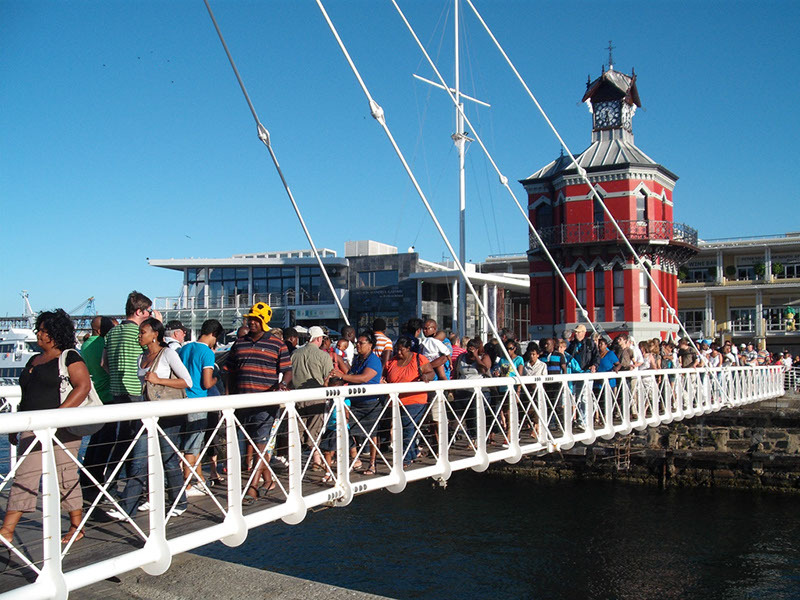 The Victoria and Alfred Waterfront also facilitates many adventure tours and must see exhibits, like the Springbok Rugby museum which is a permanent feature, or visiting exhibitions like that of LEGO brick sculptures by New-York artist Nathan Sawaya which was held recently. Top Guest Facility Bayview House, is situated just a few minutes drive from the V&A Waterfront. Bayview offers guests a quality of service and personal care, that is reflected only by the best that Cape Town and top facilities of the V&A Waterfront have on offer.